This documentary has a most serious intent. Too often in the past education reform has been more concerned with addressing the obvious symptoms of a problem, rather than addressing the cause of the problem itself. Now in the early 21st century the present arrangements are so overlaid by layer upon layer of ‘quick fix’ solutions that to cut through to the underlying causes requires a level of knowledge and background most people simply just do not have. If ever it was true that a people who forget their history simply live to make the same mistakes all over again, it is now. The situation is serious. The spectacular rise in the standard of living in recent years has created an extraordinary paradox. The busier and wealthier people have become the less time they seem to have for each other. This has created a crisis in how to educate the young. England which only two centuries ago led the entire world into the modern industrial age by merging the genius of the few with the applied creativity of countless self-taught craftsmen, has forgotten the adolescent’s instinctive need “to grow up” by so learning to do things for themselves that they emerge as responsible, skilful and thoughtful adults. Instead of fostering such innate creativity the English, and subsequently other English speaking peoples, have started placing their faith in forms of institutional schooling that so go “against the grain of the brain” that they end up trivialising the very adolescents that they claim to be supporting. By ignoring recent research in the socio-biological sciences, schools continue to over emphasise conformity and standard procedures. While the human brain has evolved to function effectively in complex situations – we naturally think big, and act small – modern education has become side-tracked into creating specialists who are well-qualified in their own narrow disciplines, but nothing like as good at seeing the wider impact of their actions. Because formal schooling has done its best to neutralise the impact of adolescence, recent generations of young people have been deprived of the strength of making difficult decisions, and learning to pick up the pieces if things go wrong. Civilisation can never be taken for granted for it depends on a constant supply of responsible and tough new adolescents to replace the worn-out skills of their elders. Education is a multifaceted process that policy makers in many countries simplify and codify at society’s peril, for to put excessive faith in a highly prescriptive form of schooling inhibits the very creativity and enterprise needed for an uncertain future. This process has been exacerbated in recent years at National politicians have sought to take ever greater control over its delivery, almost regardless of what might be the specific circumstances of individual communities. It is not simply a crisis of schooling that has to be faced, but the much more serious problem namely a collapsed families and the emasculation of community. Over the past decade several English speaking countries, have focused their reforming strategies on ‘breaking down’ the old structural arrangements in the hope that this shakeup will induce reform right across vast systems. The alternative is to concentrate on the minutiae of improving the personal motivation of individuals at all levels so as to ‘build up’ a widespread sense of community ownership, to create the energy for continuous improvement. The larger the unit to be reformed, the more difficult it is to invest in a ‘building up’ strategy, yet it is only by investing in the intrinsic motivation of individuals in each community that entire systems develop the capacity for continuous development. 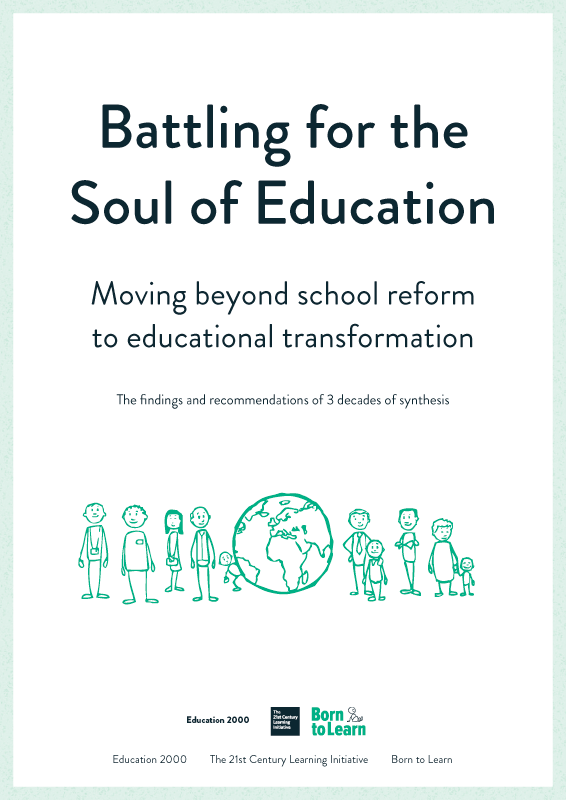 Most regrettably England and the United States have progressively removed the control of education from local communities, thereby directly being answerable to large scale national directives, applying the ‘break down’ model of development. This documentary aims to help the English find a way out of the ever deeper hole they have dug, by concluding with a study of the Canadian province of British Columbia. This province has progressively reinforced local community ownership as a way of reaching standards of achievement already well in advance of the English and United States systems. With only 4.5 million people – one twelfth of the population of the United Kingdom but scattered over the land area three times that size – British Columbia has no difficulty in finding sufficient people to stand as trustees of the 60 school districts, each administered with apparently greater efficiency than England can do with its ever more centralised government. In placing its faith in local decision-making British Columbia is far better able to innovate than is possible in more congested England, where economies of scale too often prove to be a dangerous illusion. 20 years before the English established a tripartite system of secondary schooling in 1944, British Columbia had already started to adopt John Dewey’s belief that “education is life, not a mere preparation for life”. England could also develop the brilliance of its children’s minds if it heeded the message of this programme and started to build the system up from the bottom by investing in the intrinsic motivation of whole communities, rather than being constrained by its draconian ‘command and control’ methodologies. So there is a technical challenge, people are losing patience with printed text when there are more immediately attractive technologies. People look to television to give them quick, straight forward explanations. While a television documentary is the most appropriate of the present media to deal with this issue it has always to be remembered that if the audience’s attention is lost for even a couple of minutes they can simply turn it off… long before the main point has been concluded. The delivery of such material as this has always to be fascinating, fun and mentally challenging… which is itself, a challenge when we are aiming to change the very way in which people look at an old problem but with new insights.